Holistic Therapy appointments bookable at B&B. 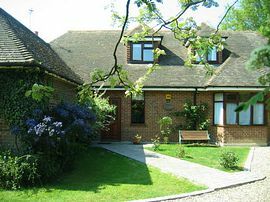 Accommodation consists of comfortably furnished double/single rooms (cot available on request), all with en-suite or private bathrooms, coffee/tea making facilities, hair dryer, TV and internet access. Local produce is used wherever possible for breakfast and long stay parking is available by arrangement. We now offer holistic therapies from a qualified therapist. So you can enhance your stay by relaxing and enjoying a luxury therapy to take your mind off the stresses of daily life. Perfect for Stansted Airport, London or Cambridge. Green Tye is an ideal location for those using Stansted airport, for business people or shoppers wishing to journey into London or Cambridge with trains running from Bishops Stortford or Sawbridgworth. With such a picturesque area we are ideal for ramblers and have a local public golf course at Little Hadham. Single Room: From £35.00 per room including breakfast. Double Room: From £55.00 per room " "
Family Room: From £60.00 per room " "
Open all year round except Christmas. Located in the village of Green Tye, Nr Much Hadham, look out for the Prince of Wales Public House, then take the left turn as though your driving into the car park but take lane on left hand side. High Hedges is the 1st chalet bungalow on the right.